It's almost in original condition. Only 2 previous owners, under 28k on the clock. It has new cylinder and piston fitted. Runs nicely and feels good to ride. I dreamed one of these since I was 17 and still rode my '06 DT125RE. This feels pretty much same, there is just much more torque and power to use. Also suspension is a lot better. 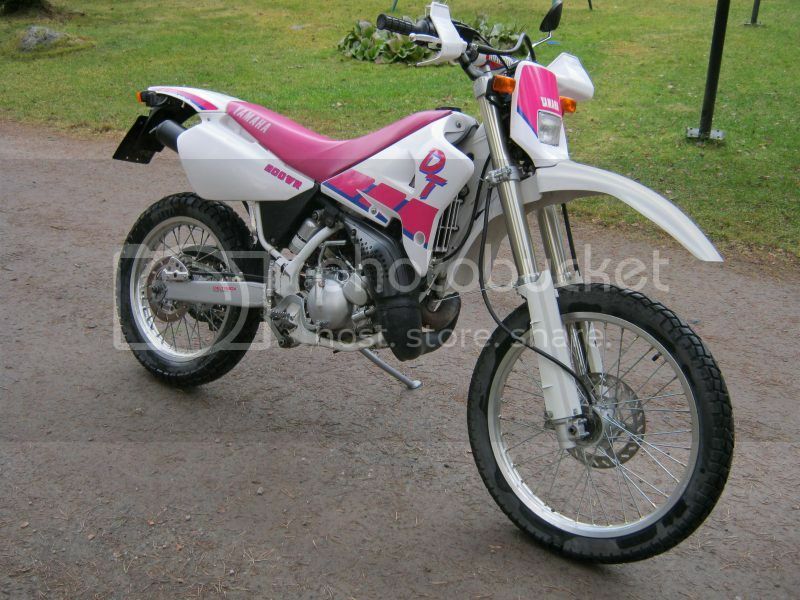 It just needs rougher tyres and some nice exhaust. 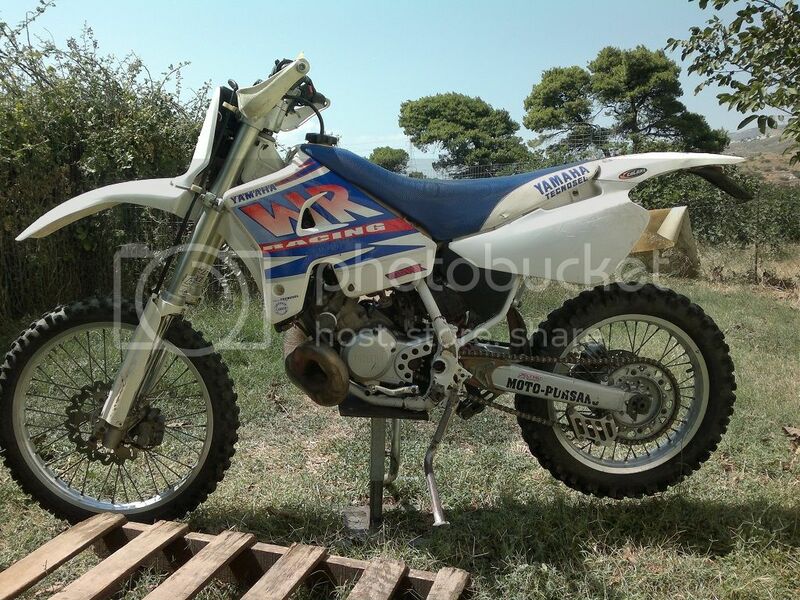 I had Doma pipe in my 125RE and I think I'll buy Doma for this one too, they seemed to have WR200 pipe on the list. Then I think it will be really awesome little trail runner. "There are two kinds of motorcycles. Yamahas and almost Yamahas"
a good find ! they were imported in Finland? 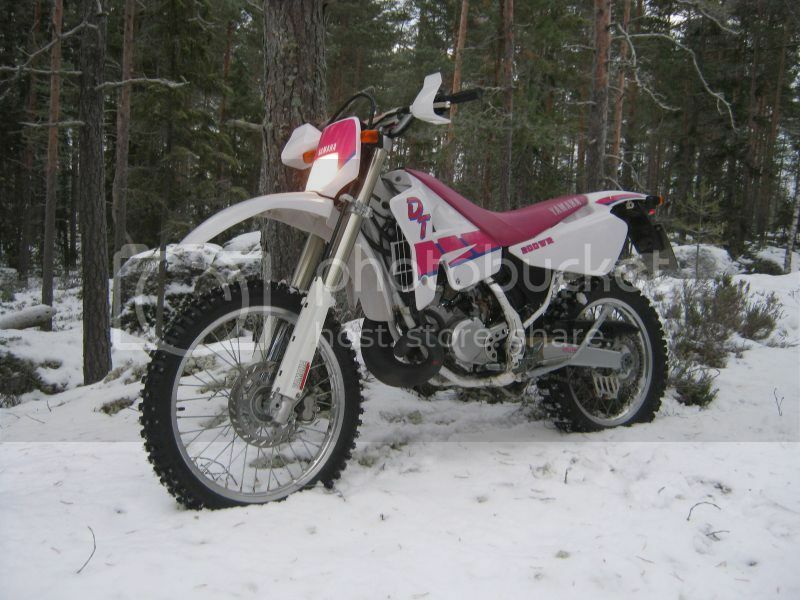 Yeah, Finnish Yamaha importer Arwidson brought some bikes here during early-mid 90's. These are rare bikes here, I have seen maybe 5-6 of these for sale since 2009 when I first time heard about these "Big DT's". I heard rumour that Finland was only north-european country where these were even imported. 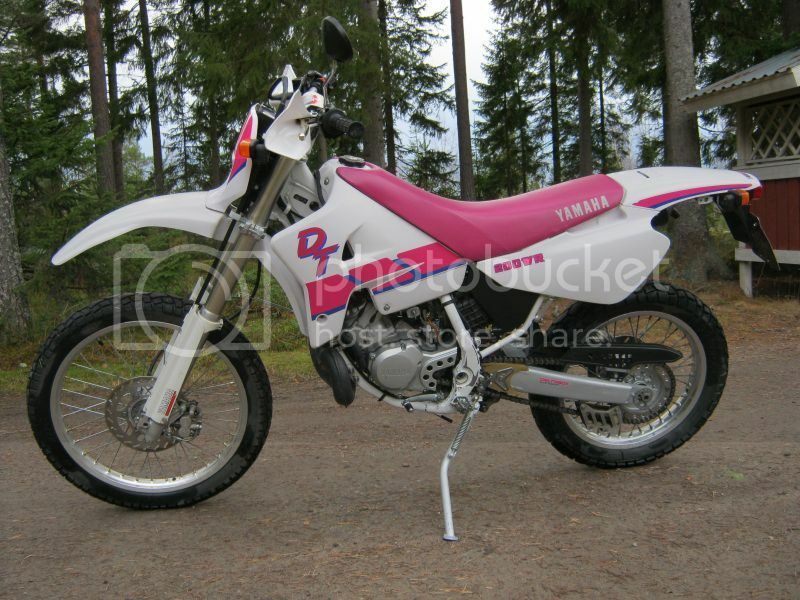 well Finland could be the only EU land that ever imported Dt200wr. what is the usual price for a second hand one in a normal and acceptable shape ? Those few ones that I've seen have been around 1200-1800â‚¬. thanx .. and again nice bike! 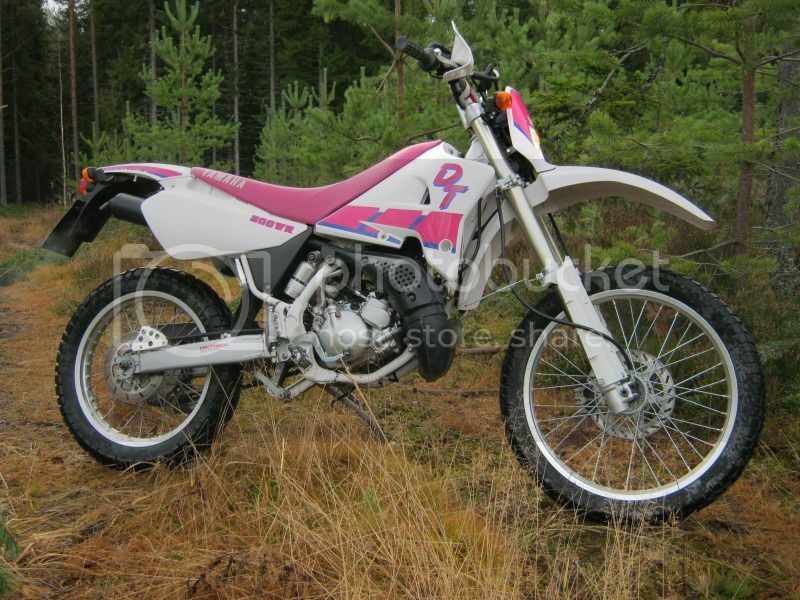 If mine i would sack this baby pink colour ..
That's a great find McPaavola (it's Andy isn't it)! This is a great example. Congratulations on a great buy! This is my favourite bike. Anything you might need ask and maybe I'll have access to it. Enjoy! PS: Why did you sell the IT? Do you still have the TZR? 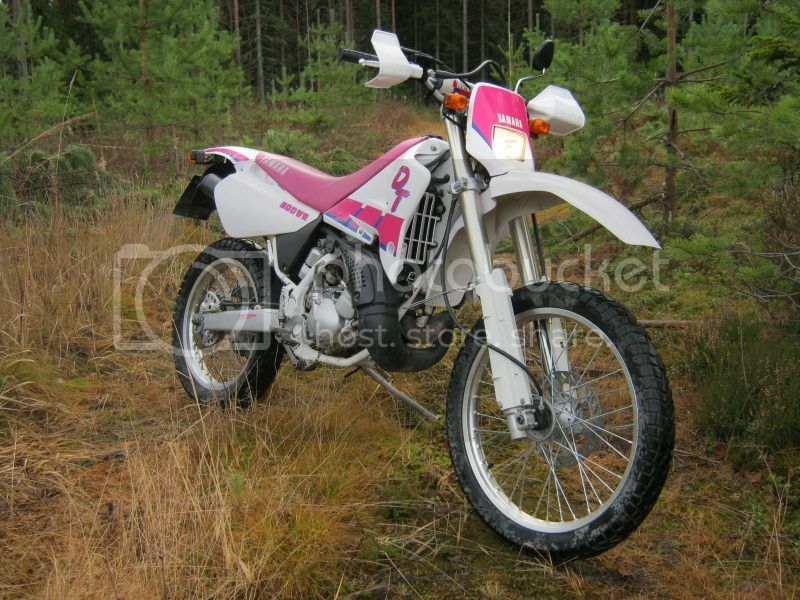 If mine i would sack this baby pink colour .. I find myself agreeing with you! Nice purchase Antti. Pity about all the gremlins that were in your IT. Well, IT was just rough bike for me. And I have quite limited space to store my bikes, so if I wan't to buy one, I have to get rid of one. And as I wrote, 200WR was one of my dream bikes since I was 17. And yes, I still have my TZR. It's one of those relics that I won't ever sell. I rode approx 4700km's during this season. this is a nice one too ! Now bike looks good, feels good and sounds great! I don't even ride my bike if the wind is blowing too strong, how do you get out there in the snow? Mind you that was a lot of a-rippin' and a-tearin', great footage. Now that's some proper use! Don't let anyone speak of abuse! This is how it's meant to be ridden! Ok, i would leave the snow part out of the equation . What do you think of my all time favourite bike? Does it feel kinda heavy? Have you tried the different settings on the suspensions? What about power? Come on, I wait for a review from a new owner, I am too much in love with this bike to find anything bad about it....or to publicly announce them! 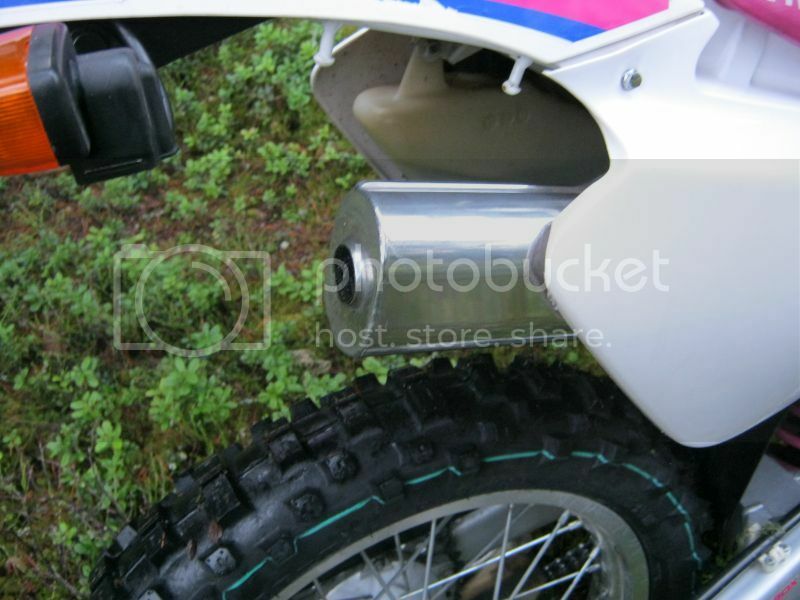 i also wanted to mention that the FMF silencer seems to take the powerband up a bit, performing better on higher rpm, without hollowing out the middle range. It seems like it's taking something off the bottom end though, doesn't it? I mean compared to the stock, heavy silencer! Thanks for sharing Antti! Great vid...that thing rips...great traction in the snow....makes me think any offs won't be all that soft and fluffy like. That's a great example you have there of an original DTRW. There won't be many like that left in that condition. Good to see you get on the pipe there - I would imagine it hasn't had much of that in it's 28,000km life! Sounds awesome. That's pretty cool. 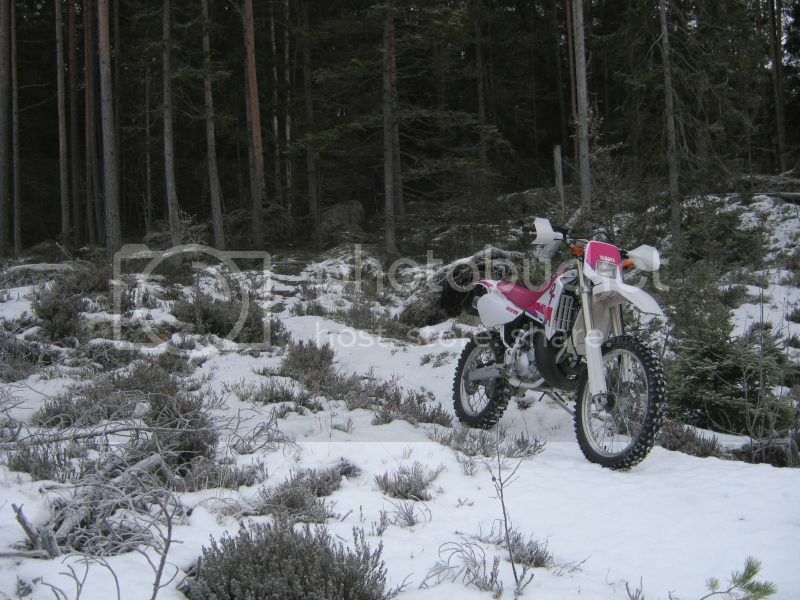 It's such a foreign sight for many of us to have the area you live in and the riding areas under so much snow. Foot down on those icy corners - wooohoo. I've done some high country snow riding, it's hard work and fecking cold! 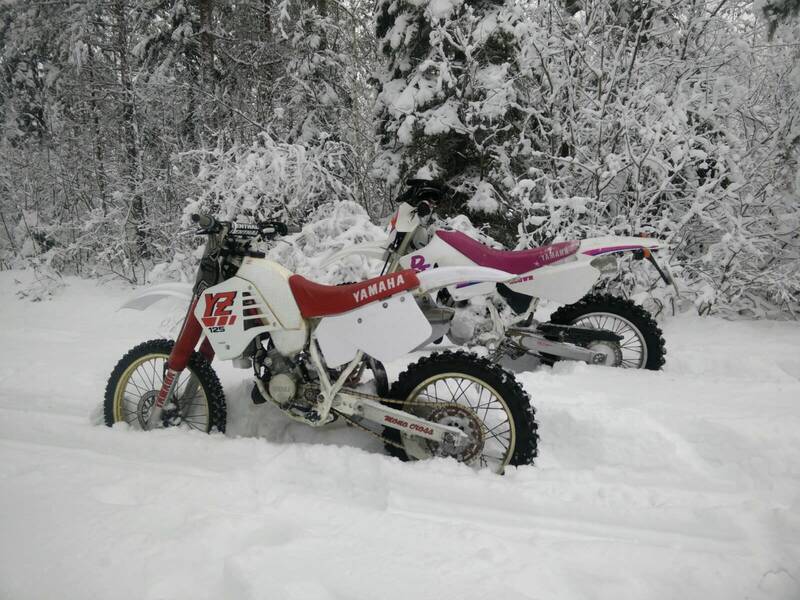 It's fun to ride in the snow. I just need to order new rear tire, cheap chinese tire + Pro Gold studs were not good combination. 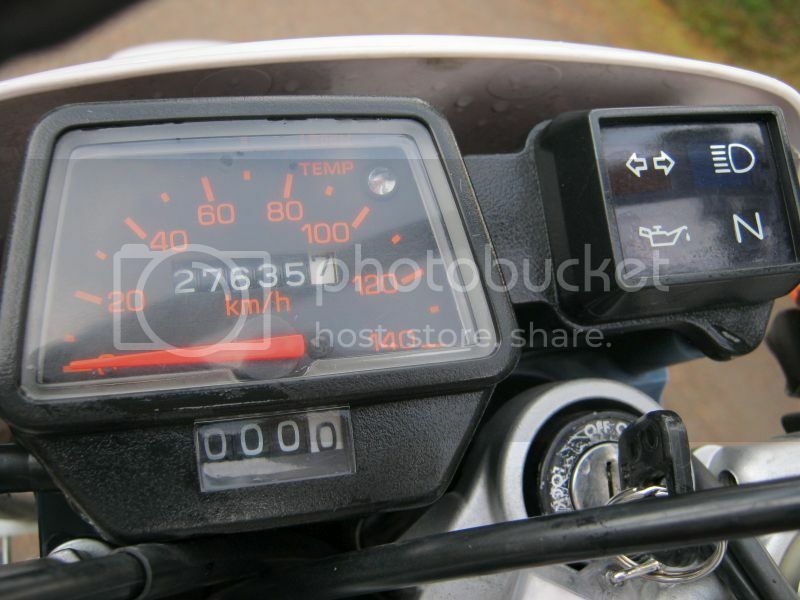 ~150km's of riding and it's dead. I think tire is too hard and studs won't hold up, many of them have fly away and others are almost worn out. Next I'll try professional made Mitas tire with rally car studs. One friend of mine has one in his KTM EXC300 and he said it's really good tyre. In the front I have Trelleborg enduro studded tire, which I bought from swap meet for 20â‚¬. It has awesome grip anywhere. And yes, with that Doma pipe it's awesome runner. It goes anywhere where I wan't to. 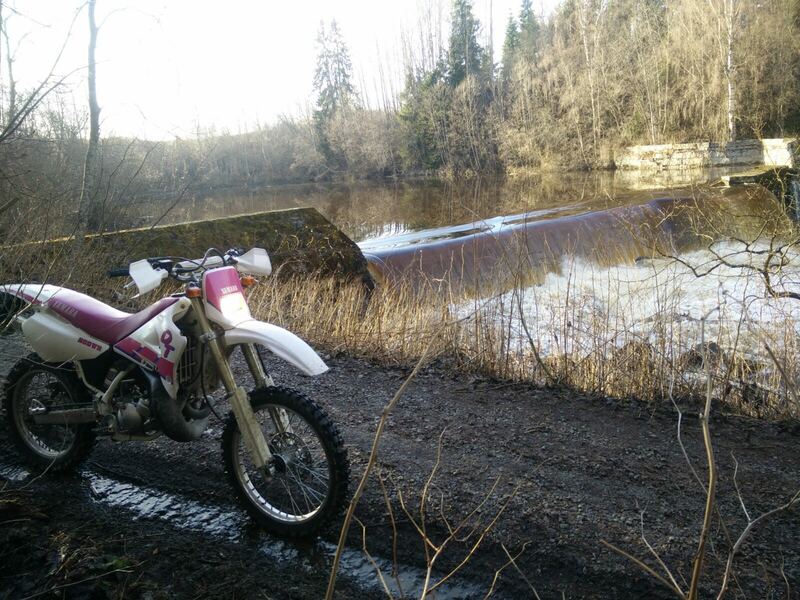 And yeah, I left a mirror on the shelf, it is not very essential equipment when riding in the woods. Did some heavy carb adjustments month ago, now it runs really sweet. 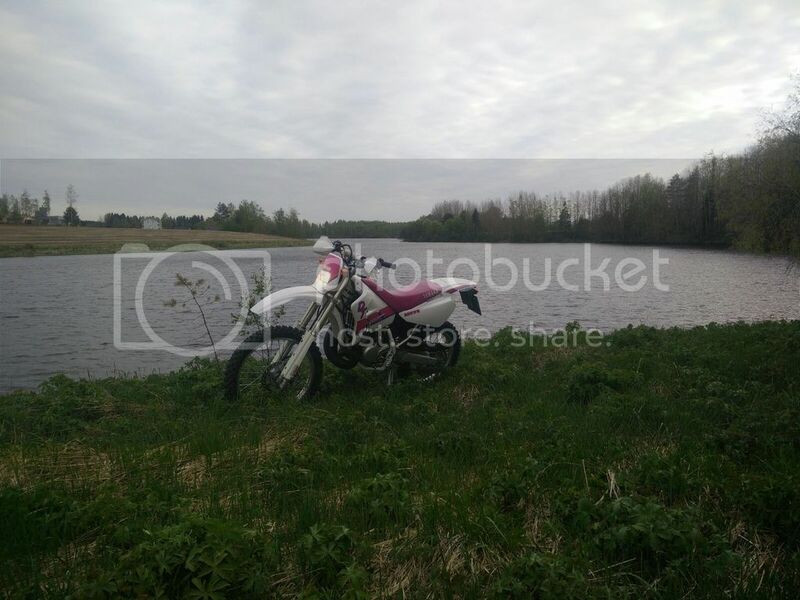 It's always fun to take little adventure with this little bike. 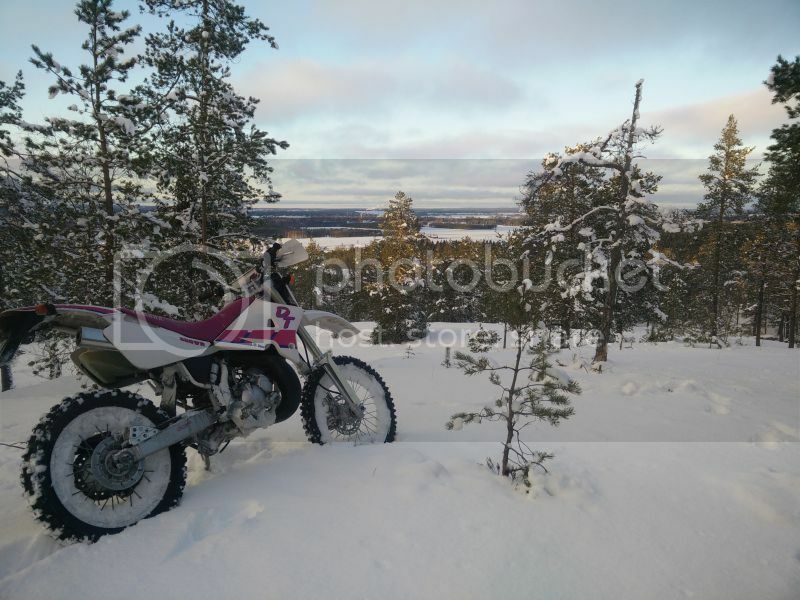 Great pictures Antti! Thanks for sharing! What do you think of the bike in general, now you've had it for some time? Compared to the IT? Well, only thing what I miss from IT, was that front wheel lifting power peak. Overal this is much better. Power comes out smoothly, low end torque is good, suspension works nicely. It feels good even on tarmac roads. 100-110km/h is fine speed for this, IT felt like it blows up anytime in same speed. Seat height feels like it is little bit too low for me. If I've understood right, WR seat is little bit higher? Yes mate, it is a bit higher. 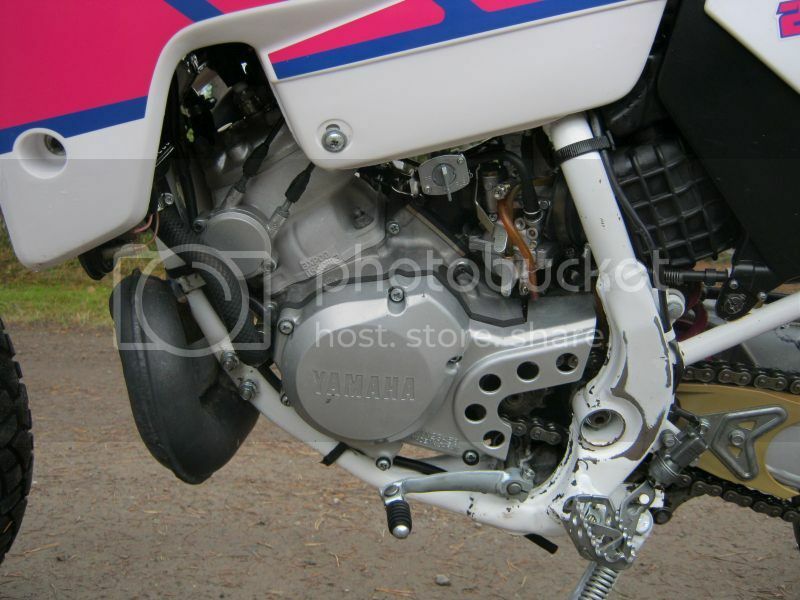 It must be at least 2cms higher, it is more level so it allows for better and easier movement of the rider! 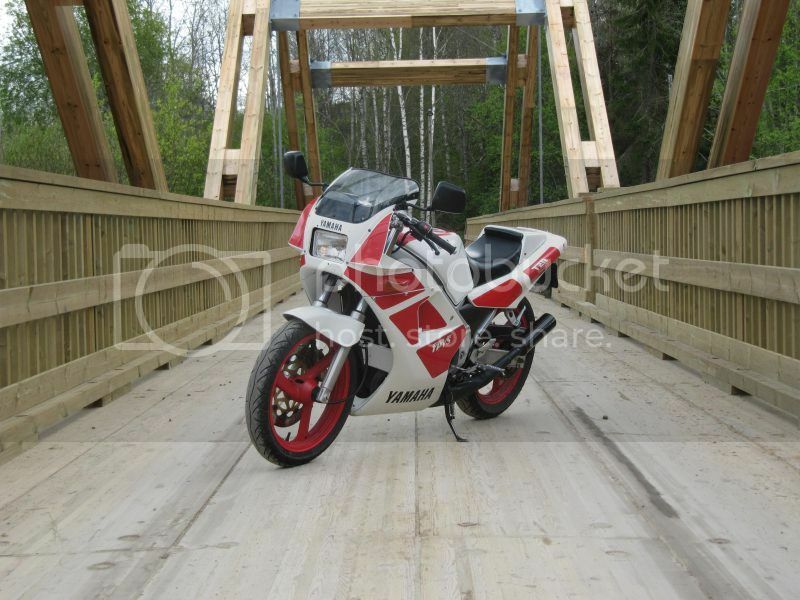 Here is a picture of a friend's of mine DT200WR with WR200 fuel tank and seat! 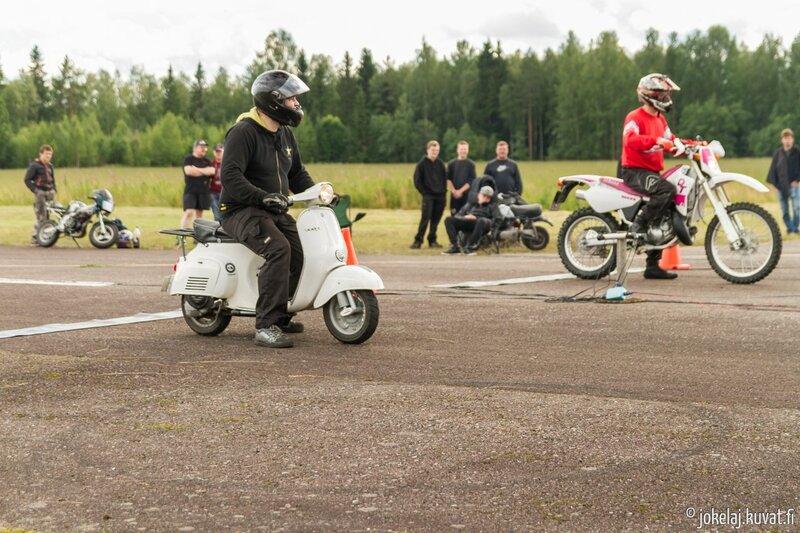 So WR showed up in the PV-Foorumi's VauhtipÃ¤ivÃ¤t (Speed days) drag race event last weekend. 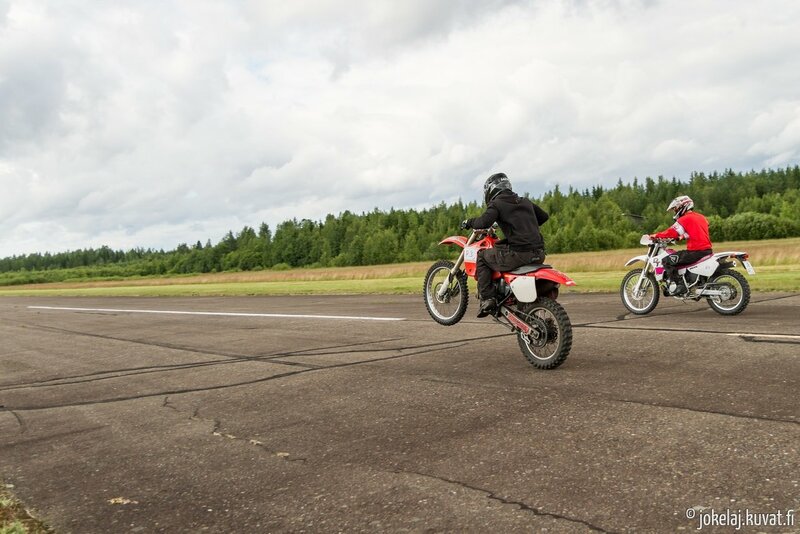 It's 1/8 mile race held in small airport near PieksÃ¤mÃ¤ki. It's mostly for small Suzuki bikes, like PV50 (similar to japanese EPO) and RB50 but we have bigger bikes too, like that white '74 Vespa Primavera with 150cc Parmakit setup and ported CR125 Honda. 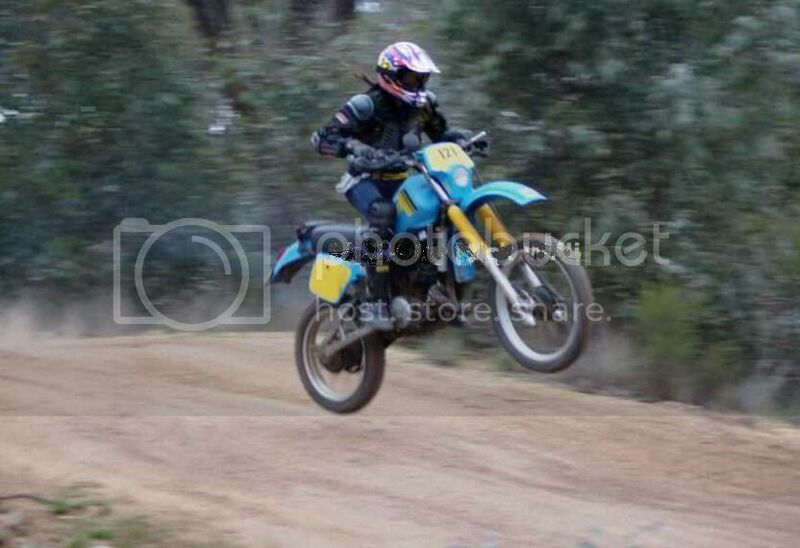 I was 2nd in under 250cc class, that CR was just too quick for me! Overal weekend was really fun. And everyone who tested my WR liked it very much. 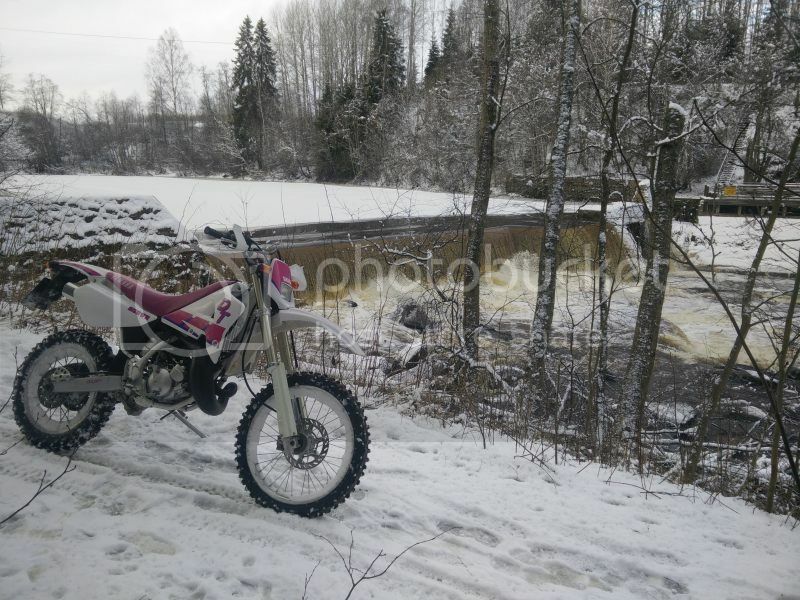 Here's link to Jarkko's photo album from our weekend, you can spot me with my cool vintage Yamaha shirt from several pic. Winter has arrived and DT got good used spikes. Just waiting for new repro decal set to arrive that I can replace those worn rear fender decals. No snow here.... Just miserable, damp, dull weather ! It's been a while since last reply. 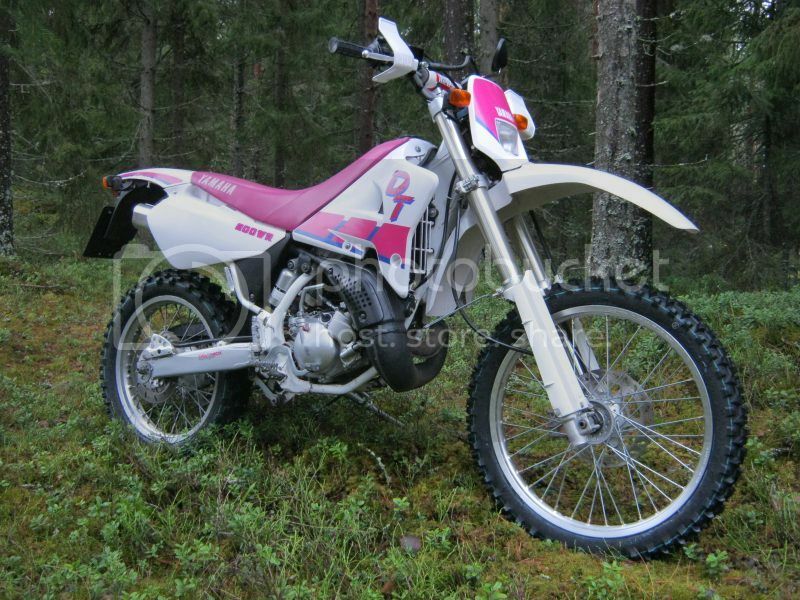 It's spring here in Finland too and today I swapped spikes to new pair of Metzeler MC5's. 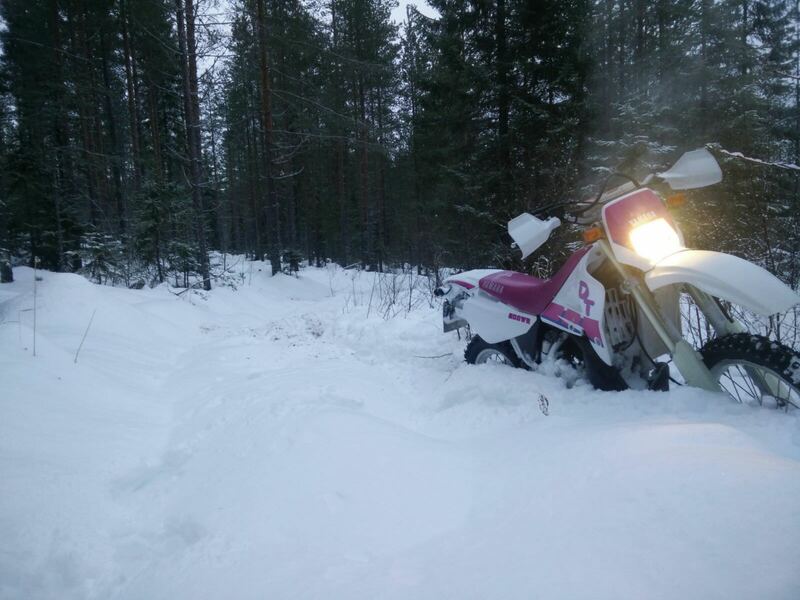 I didn't ride very much during winter, there was plenty of snow first time for years so I usually took snowmobile rather than WR. This was taken 1.1.2018. As you can see, we had already quite much snow. That was hard ride, bike didn't go anywhere and I had slight hangover. 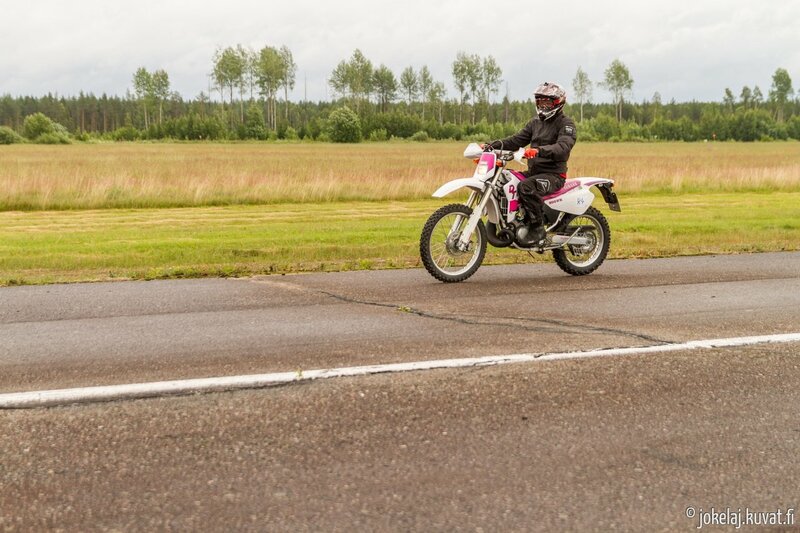 Some weeks later when I rode with my friend and his '88 YZ125. 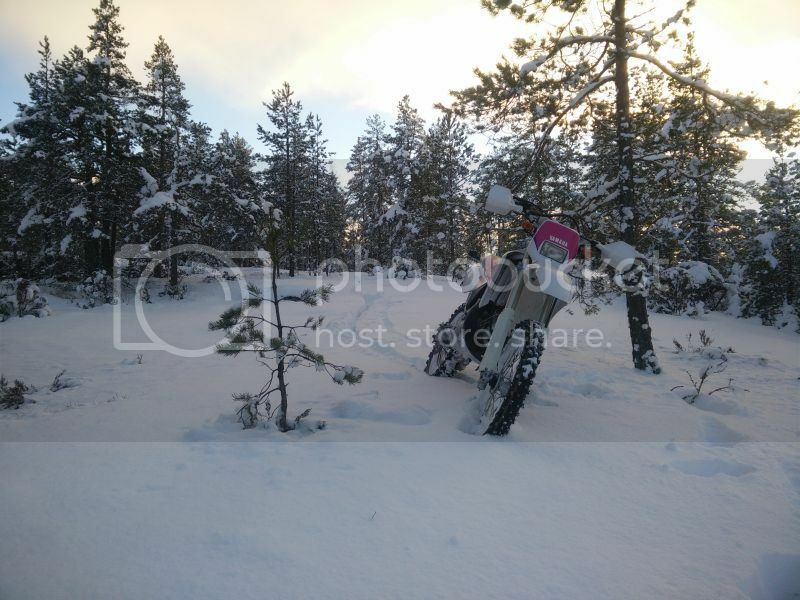 It was too much for the YZ, big end bearing gave up after desperate pinning in the snow. It was pain to get it out of woods. Excellent photos McPaavola, thanks for posting them. The 200 is looking good. This one has sat in the garage since last summer. 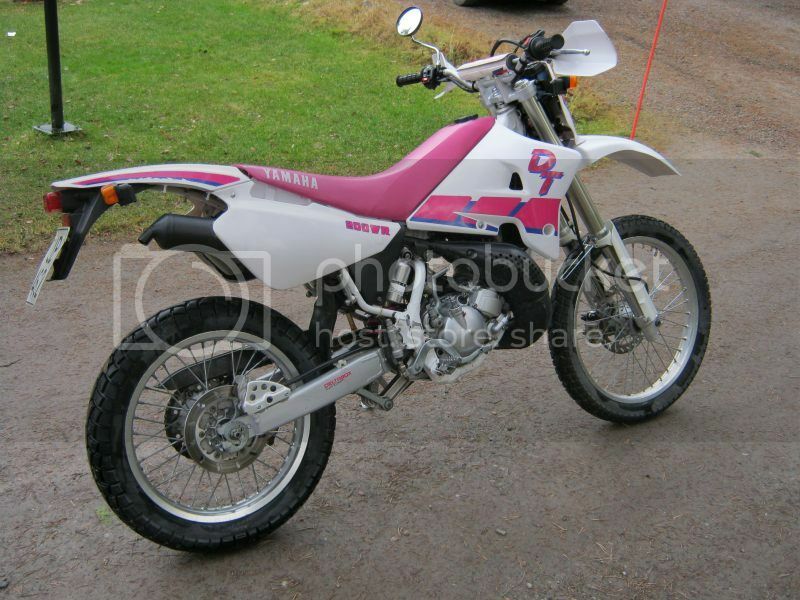 It's not been insured since I bought YZ. So... After some thinking I decided to sell this beauty two weeks ago. Fortunately it found a good new home because my cousin wanted to buy it. I know he respects bike as it is and doesn't ruin it anyway. And I can still buy it back in the future. I hope (and I know) my cousin enjoys about the bike as I did when I owned it these 3 1/2 years.